Picture this- you are on a 2-hour flight and your co-passenger tries to strike up a conversation with you. Obviously, trying to be polite, you may initially decide to participate. But after a while, your interest in carrying it forward and even your responses may entirely depend on how ‘interesting’ or ‘engaging’ the other person seems. Now put yourself in that person’s shoes. What if you were the one who initiated the conversation? Did you seem interesting to the other person? Could you hold the conversation for a sufficiently long period? There is a gentle balance between being interesting to the other person and being interested in the other person. And this balance is critical for creating and sustaining any good relationship. Only being interested in the other person and having nothing to contribute to the conversation can make you seem dull. Similarly, you can be perceived as a bore if you are always trying to seem interesting by only talking about your views and insights. 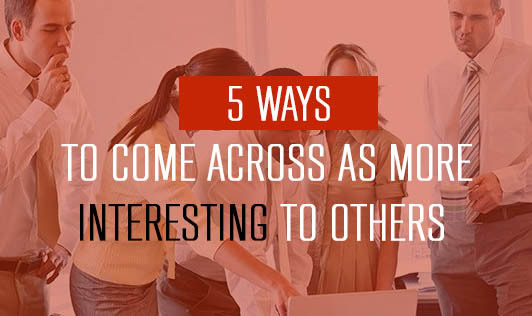 This article helps you with tips on how you can be interesting without being a bore. At this point you should know that being more interesting isn’t necessarily about sitting at and home, googling, and memorizing fun facts and interesting topics to discuss when you’re out. It definitely requires work. The below tips can help you become more interesting without crossing that fine line, separating interesting from boring. This is the golden rule for building personal relationships. Don’t be afraid to open up and express your opinions. It is crucial because it helps your partner understand you better. Avoid giving single-word answers like ‘fine’, ‘yes’, ‘no’, and ‘okay’. Such responses will only invite more questions. Instead, when your partner asks you a question, take 5 seconds to think about your response and then begin divulging the details. Such a response will help make the conversation richer and more meaningful. During casual conversations, always remember to focus on the positives. In social meetings, people are generally not interested in hearing about your health problems or everyday troubles. When you do feel the need to talk about something troubling, approach a close family member or friend. Read, read, and read. And this does not mean celebrity news and gossip columns. Read a quality national or international newspaper at least once a week. Here, you can find a wide variety of articles placed under numerous topics. This way, you will never run out of interesting things to talk about. Read editorial bits and listen to professional commentators. When reading a paper or a magazine, always check for the editorial columns. These often give you both sides of the story. The same works for radio. Listen to hosts who provide good information on their shows. Gather information from multiple sources and you can come across as well informed. Never let humor go out the window. Try it even if you are not good at it. Learn a funny story or joke, or narrate one of your funny experiences. Try to get others to laugh and you will instantly be a hit in your social circle. It is never easy to strike up a conversation with a random stranger, especially at social events and gatherings. To avoid awkward silences, try to accumulate fun and interesting material to bring up. Prepare in advance and rehearse it in your mind before saying it out loud. As far as possible, try to stick to the generic stuff. Tuning in and listening (really listening) are crucial, especially during meetings. If the other person isn’t interacting, you can always ask questions to introduce them into the conversation. You can also start speaking about a topic and ask them for their views and opinions. When you are interested in hearing what the other person has to say, you will automatically seem interesting to them.